160 pages | 26 B/W Illus. Stroke, Body Image, and Self Representation provides a psychoanalytic reading of the subjective difficulties encountered by patients who have suffered a stroke. The book is based on the words of stroke patients and on their self-portraits, which are then compared with the words and portraits of subjects devoid of brain lesions. Pathological and normal self-portraits illustrate in very concrete terms the libidinal investment of our body parts. The author's original data sheds an entirely new light on the subjective effects of a stroke. On the one hand, the permanent sequelae of a stroke can cause a narcissistic injury; on the other, a stroke may affect the brain circuitry involved in the patient's body image, undoing the normal narcissistic reactions. This may happen after right hemisphere lesions and cause spectacular symptoms, such as the personification of a paralyzed hand or the apparent ignorance of a severe paralysis. This double aspect of a stroke is no small problem for rehabilitation therapists, who must avoid two pitfalls: considering any issue as psychological in nature, as if the brain lesion could not produce any organic changes, or, on the contrary, attributing any behavioural problems to brain dysfunction, as if the patient was devoid of normal psychological reactions. One of the aims of this book is to help therapists gaining their bearings in this little-known field. 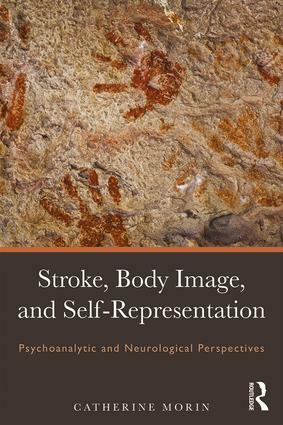 In addition to this clinical interest, the author's psychoanalytic reading brings an original contribution to the physiopathology of cognition and self-representation. The data gathered by Catherine Morin show that self-representation cannot be considered only a cognitive operation. They also suggest that normal cognitive activity relies on both the stability of body image and the repression of the object. Stroke, Body Image, and Self Representation will appeal to psychoanalysts, psychologists, social workers, psychotherapists, psychiatrists, and rehabilitation therapists working with stroke survivors and patients with body image disorders. 6. CASE STUDIES. PERSONIFICATION OF THE HAND, BROKEN UP BODY, ORALITY DISORDERS, AGGRESSIVNESS AND TRANSITIVISM. Catherine Morin is a neurologist and a researcher (INSERM) with neurophysiological and psychoanalytic training. She has been involved in the rehabilitation process of stroke patients at the Rehabilitation department in the Hôpital Pitié-Salpetrière in Paris from 1972 to 2010. Since 1983, both her clinical and research work have been on body image and body schema disorders after a stroke. She is a member of Association Lacanienne Internationale and of the International Society of Neuropsychoanalysis.